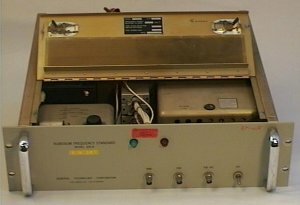 Instrument provides standard frequency outputs of 5 MHz, 1 MHz and 100 kHz, via BNC terminals mounted on the front panel. A vapour of Rubidium contained within a small glass cell has an unvarying absorption frequency fo of approximately 6834.68 MHz. The crystal oscillator within the device nominally operates at a frequency f, an integral submultiple of fo. An error signal proportional to the difference (f-fo) is developed and applied to the oscillator, such that the difference is reduced toward zero. In this way, the stability of the Rubidium frequency is transferred to the oscillator, whose signal is translated into the standard output frequencies. The device provides a quoted long term stability of 1 part in 1010. 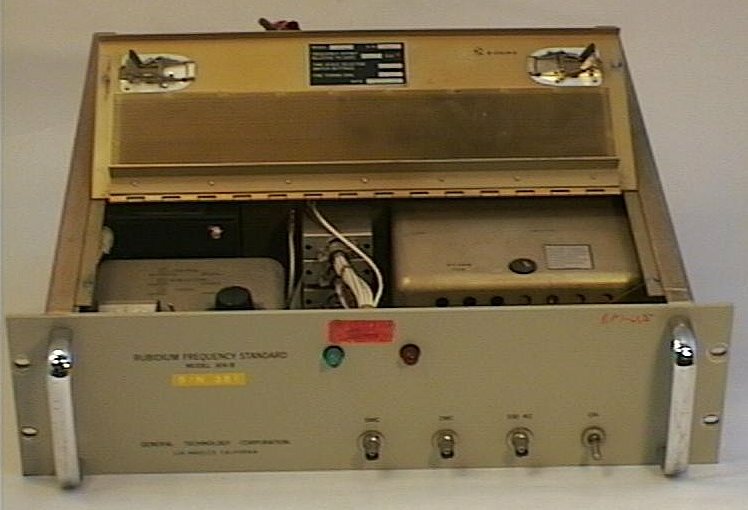 This particular instrument was used by the late Dr. J. Crouchley, formerly of the department's ionospheric group, in VLF monitoring experiments.